My Enclave pendant arrived today! Now I can record my thoughts about those other Enclave knuckleknobs and how they completely screwed up rebuilding the Wasteland due to pettiness, bickering, lies and criminal recriminations! This entry was originally posted at https://laridian.dreamwidth.org/2988787.html. Please comment there using OpenID. Part 3, Chapter 2 is now on AO3: I Was the One. Gunn looked ready to either pass out or start shooting that .45 at ghosts. Boone had seen those eyes before, on soldiers, and hated seeing them on Gunn now. The gamblers at the tables stared at them as Boone steered them toward the front door. "Try not to wave that around," he told Gunn. "Holster that thang, Pardner!" Gunn said, with a manic giggle, but he did try to keep his weapon at least partly under his coat. If they went to the front desk, and asked for their weapons back, would the Chairmen give them back? Where was Benny? Laying a trap? A Chairman came around a corner in front of them. Gunn brought up the .45. "Where's Benny?" he demanded of the wide-eyed man. This entry was originally posted at https://laridian.dreamwidth.org/2988457.html. Please comment there using OpenID. This entry was originally posted at https://laridian.dreamwidth.org/2988154.html. Please comment there using OpenID. Part 3, Chapter 1 is now on AO3: Remember Me? Boone's hand touched Gunnar's arm. "Gunn. Be careful." There, at the far end of the gambling hall, was the man in the checkered suit. Gunnar didn't have any weapons and knew better than to trust in them anyway. He couldn't hit a barn, after all. But he did have a surprise. "Stay behind me," he whispered, not taking his eyes off that suit. "What happened to getting our bearings?" Boone asked, but Gunnar was already walking down the hall, his gaze boring into the man's back. The staff saw him and his expression, and Benny noticed that way, turning to see who had distracted his employees. He went pale and took a step back. "What in the goddamn — !" "Remember me?" Gunnar said, his voice as much like ice as he could make it. "I want that platinum chip back. And some answers." This entry was originally posted at https://laridian.dreamwidth.org/2987869.html. Please comment there using OpenID. The final chapter of Part 2 is now posted on AO3: A Fine Romance. Gunnar was staring at one of the dead lurks. "It looks like — like —" The words wouldn't even come. "Like what? Fish? Monster?" Boone stepped closer. "No, it's — the, the thing in the story! That moves!" He could see it in his mind's eye, but couldn't even see the words. The frustration made him angry, and he slammed his fist against the rock wall, which hurt because a jagged rock wall always wins. Gunnar sucked in his breath and held his now-stinging hand. "I can't remember the words!" he cried, wishing he could, angry that he couldn't. Boone put his arm around Gunnar's shoulders and pulled him in. "You will." Gunnar pressed his cheek against Boone's. Lost words. Lost memories. Lost home. Lost mind? He closed his eyes as Boone's arms went around him. Steady. Calm down. And he did. It felt good, Boone steady as any rock. After a moment Gunnar put his arms around Boone, and they stood together in the near-dark. Part 3 will begin on Thursday. This entry was originally posted at https://laridian.dreamwidth.org/2987464.html. Please comment there using OpenID. I have so many old comics, like from the 1980s up to the mid 1990s (which is 30 years now guys, so yeah, they're old). Mostly DC. I am planning to save a few for sentimentals and just... recycle the rest or smth because comic books are not worth anything now. Especially comics from that time period. I may try to figure out some kinda craft thing or other with them, idk... mostly I just want them out of the garage and it's easier to save a few and recycle the rest. Toly has for years said we can find someone to buy them... I've carted these around for this long and I'm done. Probably everything is online anyway except maybe some of the real small indie comics. I spent my money on them, I don't expect any money back out. I don't even want to go to the effort of bulk-lotting them on eBay or Etsy - paper goods are heavy in bulk and nobody wants to pay shipping for that either. I mean, if someone *does* want some of them speak up, just keep in mind the shipping. I'll be glad to answer questions if I can. This entry was originally posted at https://laridian.dreamwidth.org/2987089.html. Please comment there using OpenID. Part 2, Chapter 25 is now on AO3: Into Each Life Some Rain Must Fall. 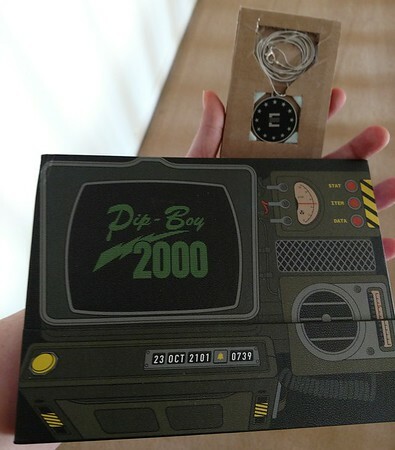 Gunnar turned on the Pipboy light when they entered. A headlamp would have been better, but this was it. The cave was uneven, nearly pitch black, and full of twists. "If you see anything, try not to shoot me," he told Boone. "Real funny." Gunnar only hoped the light would blind anything in the cave long enough for them to dispatch it. Calm down, he told himself, and took a couple of breaths to steady his heart. It's just a cave. Lots of room. Never go anywhere you have to squeeze through. That's all. This entry was originally posted at https://laridian.dreamwidth.org/2986714.html. Please comment there using OpenID. Some pictures from our yard late in the afternoon. This entry was originally posted at https://laridian.dreamwidth.org/2986414.html. Please comment there using OpenID. Sun is shining, mid-70s temps, clear blue skies. 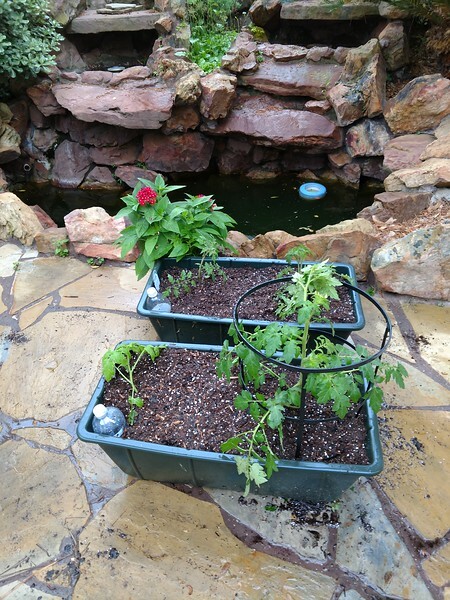 I worked some on the tomato containers and the cardinal pair came to watch me. Today I got the trash bag covers onto the containers. 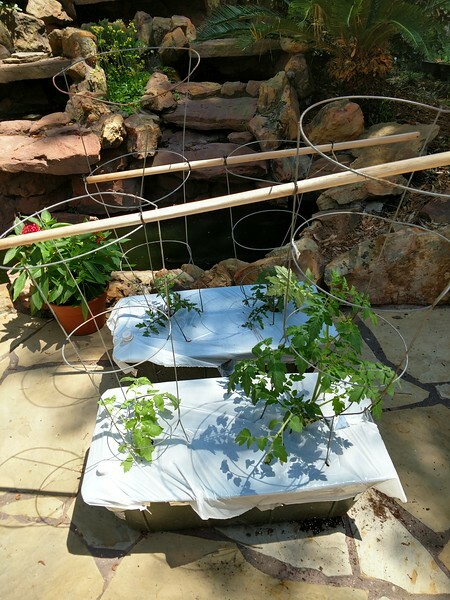 The plastic acts as cheap mulch/ground cover/ pest reducer and in the south, the white reflects the light so the soil doesn't heat up too much. It also helps keep the moisture in the soil. There are frog (or toad) eggs in the waterfall! Chimney swifts flying overhead. I got a bunch of postcards in the mail! 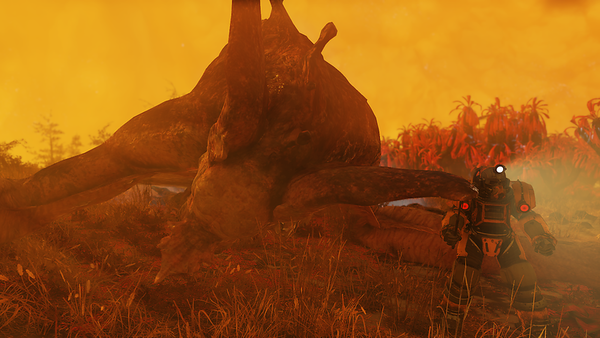 In Fallout 76, I took down my first Wanted player, which also got me an achievement, and then by happy coincidence someone nuked the Cranberry Bog while I was nearby, so I got to be part of the hunt for the Scorchbeast Queen. And omg I was so underpowered. XD I didn't have any big guns but at least I had a lot of grenades. Used up all my ammo and finally resorted to whacking away at it with my modified fire axe. BUT WE WON. omg that was a tough fight and it was awesome. Then I got my first violet flux afterward (from the nuked flora). This entry was originally posted at https://laridian.dreamwidth.org/2986118.html. Please comment there using OpenID. Part 2, Chapter 24: Be Careful, It's My Heart is now on AO3. "I made a mistake. That mistake was… not… not staying with you." Gunnar could see Boone's nervous body language against the starlit sky. "I realized it. You said even if we make mistakes, we should try to make up for them." Oh, damn, he's going to use my words against me. But most of the anger faded, if not the resentment, and Gunnar kept his tongue. This entry was originally posted at https://laridian.dreamwidth.org/2985856.html. Please comment there using OpenID. In Garden City, a heroic team tries to keep invasive plants contained. Chief Crimson Beefsteak, the oldest and most senior, is too old for this manure. Cherokee Purple and the Black Prince work together on the mean streets around the mint. Following in his parents' footsteps, Better Boy is the green, enthusiastic rookie. Together they work to clean up this dirty town and make it a productive, happy place. It's supposed to rain today so we may add more soil afterwards depending on how tamped down it gets. 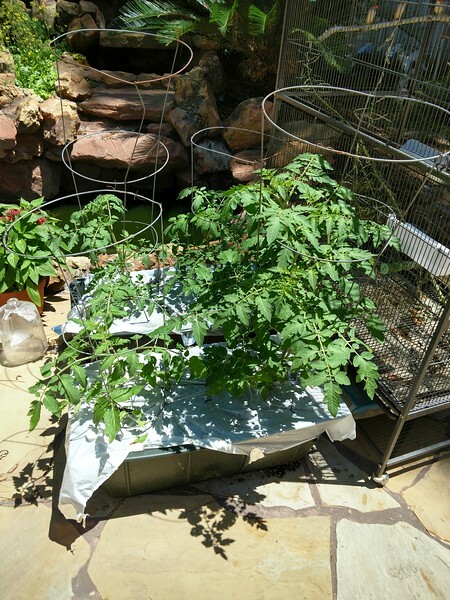 Also we forgot to put down the white plastic trash bags to keep out weeds and other pests - oops. So this year maybe we'll mulch instead. This entry was originally posted at https://laridian.dreamwidth.org/2985456.html. Please comment there using OpenID. https://laridian.dreamwidth.org/2953920.html is the master list. This entry was originally posted at https://laridian.dreamwidth.org/2985125.html. Please comment there using OpenID. It's an overcast day but Mom and I saw masses of raptors soaring on thermals and heading north. I caught a 10 second video of them. This entry was originally posted at https://laridian.dreamwidth.org/2984943.html. Please comment there using OpenID. 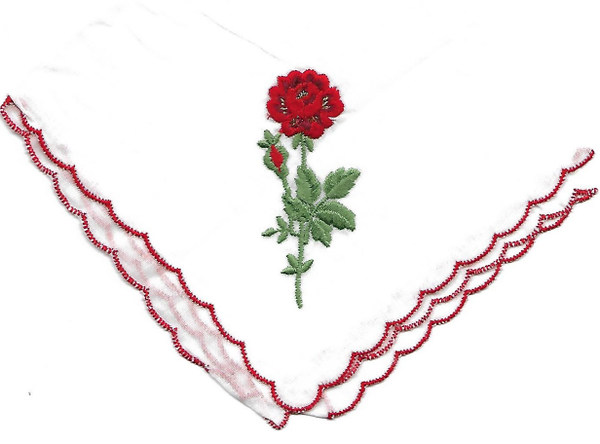 From GB-1097245: "My mother went into a care home because of dementia, and one of the many things that I brought home, after we'd cleaned her bungalow, was a pile of hankies! The enclosed is much too nice to blow my nose on, so I hope you'll use it on your quilt!" This entry was originally posted at https://laridian.dreamwidth.org/2984570.html. Please comment there using OpenID. Part 2, Chapter 23: You're a Sweet Little Headache is now posted to AO3! Boone's pack held the liquor. It was heavy and a pain in the back to carry, when all they would do was sell it anyway, but Boone had abided by Gunnar's wishes. Now he thought he could get good and drunk with it. Because why not? It wasn't like he couldn't do so now. This was the second time he didn't know where Gunnar would be tonight. It was the second time something had gone wrong. Also: Gunnar tries to go on a date. This entry was originally posted at https://laridian.dreamwidth.org/2983963.html. Please comment there using OpenID. It's a patch release for the tote bag project! This entry was originally posted at https://laridian.dreamwidth.org/2983910.html. Please comment there using OpenID. Me, stirring for what feels like ages: This had better taste good. 2.6 cups of milk. I had 2% handy. 1/2 cup "quick" grits. Mine read "quick 5-minute grits" on the box so who knows if minute grits would be different here. Don't use the stone-ground grits that you have to soak overnight. Those make great grits but, yeah, overnight. 3 T butter. I had salted butter. Yes, on top of the other salt. It was fine. 3T honey. I didn't want to use the good honey for this, so I got the crystallized stuff in the plastic bottle from the grocery store. Used a table knife to get some of the crystallized stuff in. Maybe 3T? Probably. Maybe more than that, mine came out really sweet. YMMV. Melt the butter in a pot on the stove, medium to high heat. When melted, add everything else. Whisk frequently until you are bored to tears. During this time, it should come to a boil (because I put mine on high heat so it would speed up). At that point, lower the heat and keep stirring. Eventually it will thicken up. Minute grits might take only 10 min? Seemed like mine took 20 which seems reasonable. Eventually they bubble and thicken and then you magically have this really creamy sweet stuff without the hard cronch of grits in it. Makes 4 helpings if they're generous; tbh probably more than that if you're reasonable about serving sizes. Mine came out pretty sweet. Maybe next time I could use molasses? Maybe top it with fruit? I wonder how this will taste cold? I'll find out tomorrow. This is really sort of a grits pudding when you get down to it, what with cooking the milk on the stove and all. KEEP STIRRING. 10/10 will eat all of it eventually and will make again. This entry was originally posted at https://laridian.dreamwidth.org/2983589.html. Please comment there using OpenID. 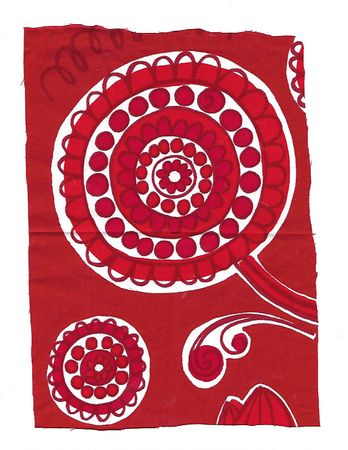 This fabric comes from FI-3453763 who says: "This red fabric is made by Marimekko, world famous design, Finnish." This entry was originally posted at https://laridian.dreamwidth.org/2983203.html. Please comment there using OpenID. Part 2, Chapter 22: The Housewife's Lament is now posted to AO3. The wind howled outside, and he thought he heard screams. Just the wind, he told himself. Just the wind. Of course people came up with — with — things that would scream in the wind. If they'd tried for the hills they might have gotten separated. Gunnar's eyes flickered open. Dream? Memory? He swayed in place as he sat, head lolling forward again. No more noise. Next time stuff something in his ears, anything. When he woke next, it was because the wind had stopped. He was still alive, and apparently unharmed. …Why wouldn't he be alive? This entry was originally posted at https://laridian.dreamwidth.org/2983071.html. Please comment there using OpenID.